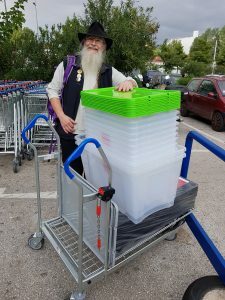 In October 2018, CRIBS International workers Sally Hyman and Fred Cairns spent a total of three weeks in Athens. It was a very busy but rewarding time. They visited all the CRIBS family and were greeted with delicious food and lots of news. Fred worked hard to get our storage area into some sort of order and two major distributions took place of household goods, clothing and nappies. 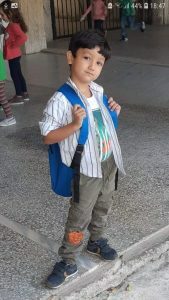 He was helped by Cribs beneficiary Nasar. Nasar has continued to manage the store distributing to Cribs families and other organisations such as the Clandestina Community. Boxing clever for our store. Thanks Fred! One day, by chance, we met a family facing homelessness with a 12-day old baby, There situation was precarious and dad also appeared to be suffering from PTSD. We managed to house them and are trying to support them as best as we can. We successfully got school places for four children, not without some struggle (more to follow). We also began links with the wonderful The Unmentionables. Through this many of the Cribs women have started women’s classes (still more to follow). Some less pleasant work involved fumigation of a flat, but the result was well worthwhile when we bumped into the family living there a day or so later. Something as simple as this had a huge impact to their self-worth. Dinner is served: such glorious food every time. None of this work would have been possible without the support of you, our donors. Well, admittedly it has been a while since our latest update, we have been busy and haven’t had a chance to write. This was also a big day for us, emotionally speaking, and it has taken us time to process the events. People often ask how we find families in need of housing from so far away. The answer is that sometimes they find us. One night in the middle of the night, Sally from CRIBS got a message that said “Ma’am, I am in a tent in Serbia with my wife who is pregnant can you help me?” Her immediate thoughts were of the cold and the dark. We didn’t know much about the situation in Serbia other than the fact that it is not welcoming to refugees. Over the coming days we learned that the family also had two small boys and we told them that if they were able to make it back to Greece then we could help them. After following their progress from Serbia through FYRO Macedonia, the day finally came for us to meet them at the Greek/FYRO Macedonian border. It was a beautiful morning and we found ourselves driving nervously towards to border to pick them up. Luck was not with us on the drive, our GPS took us on a 20 km detour, then led us over all sorts of bumpy roads through the backs of villages. The coup de resistance was when the gas light came on, and we coasted into the border town of Evzoni with the clutch firmly in as we went down the hill into town. We filled up with gas and located the Hotel Hara, our meeting point, worried that we would be late. Although there has not been much action near the border this year compared with 2015 and early 2016, when the Balkan route was still open to refugees, the Hotel Hara seemed well provisioned for the refugee crisis, with their gift shop offering tinned food, cheap shoes, rain ponchos, and flashlights in addition to the usual hideous souvenirs. 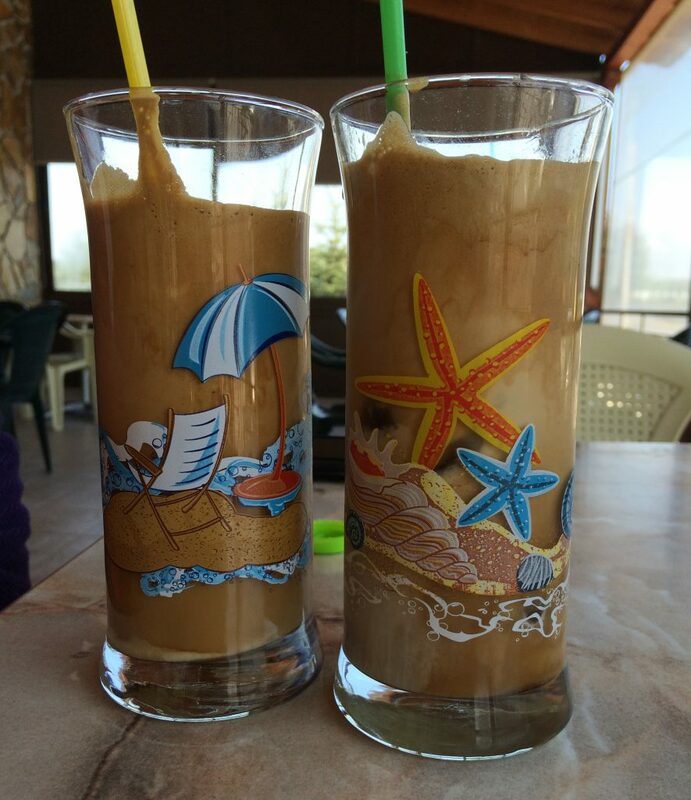 We sat outside on the terrace and drank frappes, the ubiquitous Greek iced coffee, and as happens when we are not rushing about actually doing things, were struck by the inequality and unfairness of it all. About how it would feel as a perfectly fit adult to walk 8 hours in the blazing sun, and how it must be so much worse to be walking with a heavy bag, small children who sometimes need to be carried, and to be pregnant. About how it feels to not be the master of your own life. And about all the refugees that we have met in Greece who once lived normal lives as we do and are now stuck in an indeterminable purgatory. Finally after an hour of waiting, we received the message we were waiting for. “The police have left us back into Greece land, we are at the first exit of the highway. Where should we go?” We messaged them back that we would come and get them and then we hopped in our car and tried to get as close to the border as possible before reaching the point of no return. Sally happened to have brought her passport, but Kimberly had not. Fortunately, there was a place for a U-turn about 10 meters before the border, and we were able to drive on the road leading into Greece from the border, hoping to find that elusive first exit. Trying to imagine a highway from the perspective of a pedestrian can be difficult. Things that seem so momentous to a pedestrian will pass so quickly in a car that it is hard to share the same viewpoint. We cruised slowly along the shoulder with our hazard lights on, scanning carefully for people walking off the road. We came to an exit to a service road and took it, thinking they might not wish to walk on the shoulder of a highway with two little ones. The service road let to an abandoned building and we looked it over carefully. It was situated in a charred landscape that looked like some sort of post-apocalyptic disaster scenario Remains of diapers, towels and UNHCR blankets could be seen in the undergrowth. Clearly it had been an encampment of some sort several years ago at the height of the Balkan route. We rode through it, calling out their names from the windows. Alas, our family was no where to be found. We returned to the Hotel Hara to check if they had by chance made it there while we had been out looking for them. No luck. We left our number with the woman there, asking her to call if a family of four with two small kids and a pregnant mum did show up on foot looking for us. We took another swing past the border, which was quite a pleasant little place, with picnic tables under tall trees and a few cafés and souvenir shops. We asked in the shops and the people at the picnic tables. No one had seen anyone come by on foot, which would have definitely been something out of the ordinary that people would remember. By this point, at least an hour had passed since they had messaged us and we were starting to get worried. 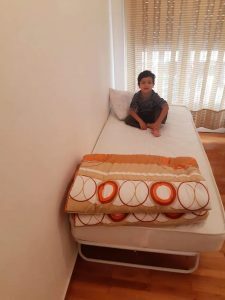 Kids or no kids, the Hotel Hara is only a kilometre or two from the border and they were no where to be found anywhere between the two, nor had they been in contact with us (which we assumed was more a telephone problem than anything else). Since the hotel was their choice of meeting point, we had assumed that they knew where it was. We decided to try the main highway to see if they had passed by the Hotel Hara by accident. We stopped at a gas station to ask if they had seen anyone pass by on foot, and the sympathetic attendant, by asking how they got to the border in the first place, gave us the solution to our puzzle. “Busses from Skopje cross the border at Eidomeni, not Evzoni”. 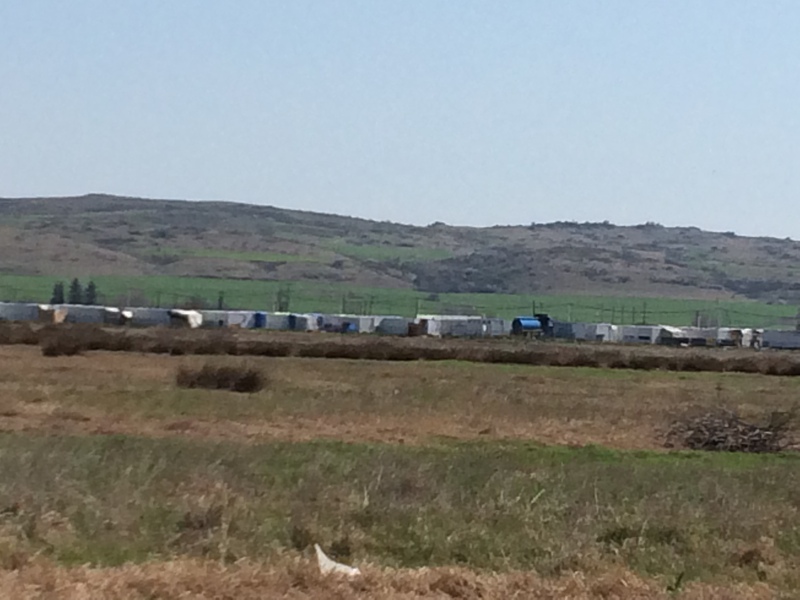 Eidomeni was a mere 5km west, so we got on the highway and headed towards it. Not long after we got on the highway, a solitary hitch-hiker appeared on the horizon. “Now is NOT a good time for a hitch-hiker”, said Kimberly, “we need to find a family!” As we slowed to pass him, however, we saw, huddled in a tiny patch of shade on the other side of the road, a pregnant woman and two children. We had found our family. It was an emotional reunion for a bunch of people who had never actually met. AD was weeping with joy, and the kids suddenly got a second wind and started to scarf down the bananas and water that we had brought. The mum, AM, seemed to have shut down and withdrawn, saying little and not wanting food or drink. They were very relieved to be in the car travelling into Greece and told us that their SIM card had no longer worked once they had got to Greece. We took them to the hotel that we had booked for them near Polykastro, got them settled in and left them to rest and shower. We made plans to meet them for dinner in a few hours. There were several other things on our to do list for the day, but none of them were close by and we realized that we would have to postpone them to another day, as meeting up with the family had taken so long. One of the challenges with everyone so spread out over the north of the country is that we ended up driving several hours a day to see people. It was not unusual to drive 70 km just to see someone. We met them for dinner, happy to see that AM was looking much better and once rested and relaxed, and we discovered that she spoke English very well, even if she was shy at first. They told us stories about their winter in Serbia, which sounded horrible beyond words. They showed us pictures of refugees with mismatched shoes and shoes gaping open with holes, standing in the snow, pictures of the 2-hour line-up for the only meal a day that was provided by volunteers. 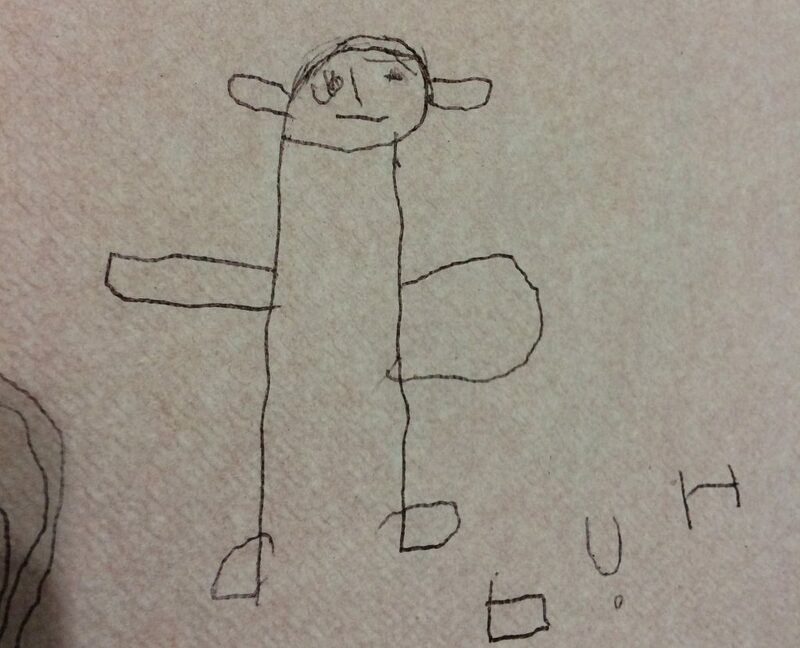 After we commented on a scar on their 3-year-old son’s hand, they showed us a picture of the third degree buns that he had because his hands were so cold that he stuck them in a fire. AD described a “reception centre” that they would sometimes go to when it was very cold (temperatures sometimes go down to -20c in the winter in Serbia) so that his wife and children could warm up and not spend the night outside in a tent. He told me that the women and children were allowed to fall asleep sitting at tables, but that the men were not allowed to sleep. He showed us a video of the guards coming around and shaking the men awake when they started to nod off. 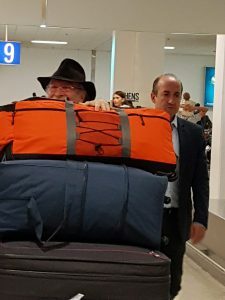 He said that this reception centre was very hard for him, he would be exhausted for days afterwards, and that he would only go because he was so worried about his wife and children. There was something almost surrealistic about how we were all sitting together, eating dinner in a restaurant, having ice creams and sitting in the main square watching everyone out for the evening. It made all of us think about how quickly everything had changed for this family over the past few days, about how a refugee’s life is all about how things can change in an instant. Sometimes for the better and sometimes for the worse. Planning for anything can be hard. Started the day with a visit to Nea Kavala camp, 1km away from the village where we are staying. We wanted to give some dates to the woman that we saw yesterday and to hopefully meet a new arrival- a pregnant woman with a one-year-old. We ran into logistical problems as the sun was bright and hot and we did not feel comfortable asking a pregnant woman to walk a kilometre across camp carrying her other baby. We sent some dates, tahini, and almonds in with our interpreter, along with the message that we would come back another day, later in the afternoon when it was cooler. After that we had been invited to lunch with a family that we are supporting in Thessaloniki and on the way we stopped in town to buy some liquid iron and notebooks. The woman at the stationery store was very interested and moved when we explained what we were doing and gave us a handful of pens and a book on babies. The generousity of the Greek people is amazing. Our lunch date was with a Kurdish couple, Rwida and Ali, and their 4 children. They are living in an apartment complex run by Filoxenia, (http://filoxenia-intl.org/), an organisation which has rented an entire apartment block on the edge of Thessaloniki to house refugees. While the location is very much on the outskirts of town, the atmosphere in the apartment block is one of joy and community. Kids are coming from one apartment to another to borrow lemons and return plates, and there is a pre-school on site as well as a school bus to take the older children to school. There was construction taking place on an on-site clinic when we arrived, to be staffed by Médecins du monde. The apartment building is new and of good quality, unfortunately because of the economic situation in Greece…..
Our meal was a very extravagant barbecue, cooked on a small hibachi in the field behind the apartments. A vegetable truck had arrived earlier and Rwida had purchased some aubergines, which she promptly sliced and interlaced with meat on skewers. 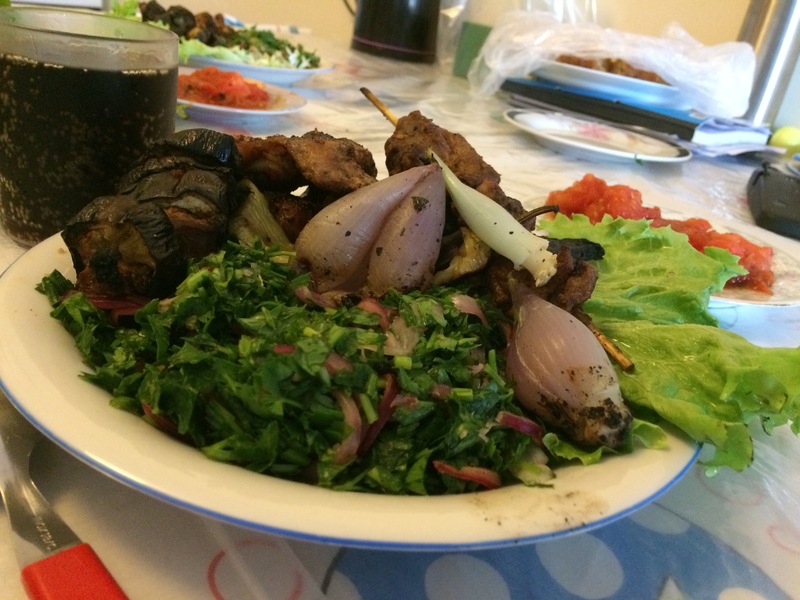 Some parsely was turned into a delicious salad with onions and some tomatoes and hot peppers grilled and back in the apartment it was expertly plated by Rwida who worked in a restaurant in Aleppo before she left. We had a chance to talk extensively to her and her family and hope to share her story here later to give CRIBS donors a personal look at how their donations are helping people get out of the camps. We left much later than planned and it was like saying goodbye to old friends. 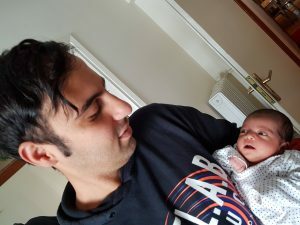 In keeping with the theme of visiting new Kurdish friends we visited a friend of a friend who recently had a baby and got to hold yet another sweet baby. One thing that pleases us greatly on this trip is that the majority of babies that we have seen are healthy and happy. A busy day overall. Started out by zipping into town, following our friend and colleague Kayra to an apartment in town where her organization houses several families. Kayra spends so much time here that she seems almost local and was able to organize a good priced car rental with Matteo, a local character who runs the only run car rental business in the village. It seems to be a moonlighting job, most likely with no office as he tends to show up either very early in the morning or very late at night at your house, with the car and the paperwork. 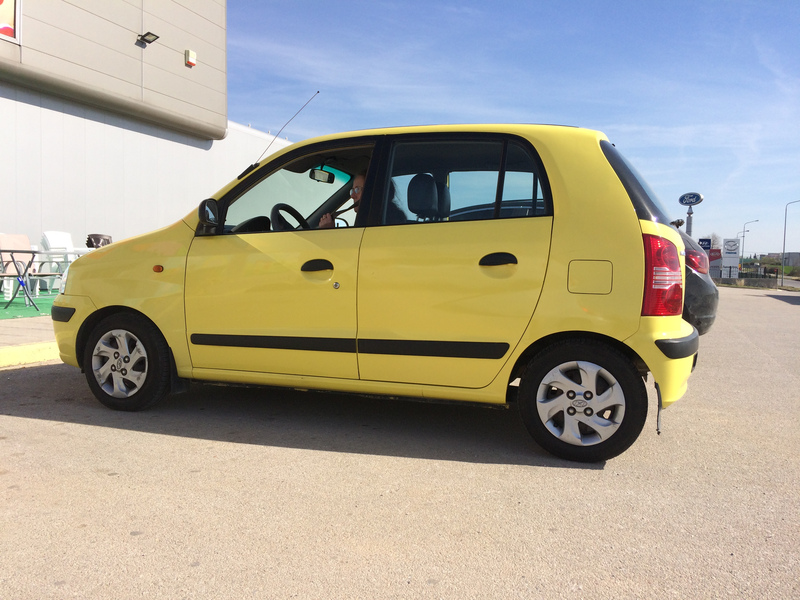 We have rented two little canary yellow cars, which makes us pretty easy to find, especially if we travel in convoy. In the apartment we started with a quick visit to meet a mom, auntie and little one. Neither the mom and auntie could not have been more than 25. Had a chat about the mixed feeding that she was doing and determined that there was not much desire to change the status quo. There was sometimes a story about feeding in the night and sometimes no breastfeeding at all. They are young and without an older woman present. This is what is needed so badly here, a network of older women to help. In Syria they would have had a big sister or an auntie present. but now, so much disruption affects the old, the very new, and all stages in-between. 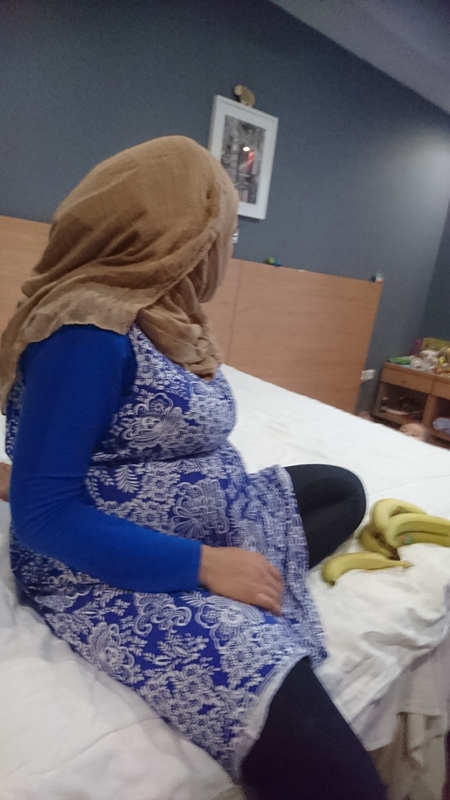 In consultation with our colleague Rivka from Birth Companions International in Canada, we went in search of dates, almonds and tahini to help supplement the pregnant women’s diets. So far several of the pregnant women we have met have been anaemic and there is good evidence that for those not diabetic, dates, which are rich in iron, improve their chances of avoiding prolonged bleeding after delivery. Tahini and almonds are both high in protein and calcium, two other important parts of a pregnancy diet. The shopping was a little awkward, however. After a fair bit of driving we found a Jumbo which sells everything you don’t want and in some abundance! (Easter decorations, barbies, scented candles). The next store was a cash and carry, selling items in bulk to businesses. As CRIBS International is now a limited company and has a tax number ( although the number was admittedly not with us ) we were allowed to shop there after much discussion and promises to send our number by e-mail as soon as we got home. The power of bureaucracy! Initially they clearly thought we were bonkers, two foreign women claiming to have a business. Once we started to say the magic word “afhimi” (tax number in Greece), they started to think we weren’t so crazy after all. The helped us out with our purchases, partly out of suspicion/curiosity, and part no doubt out of kindness for people who couldn’t read labels so well. A lot of people with businesses seemed to be buying supplies that looked distinctly personal- the perfect amount for a family dinner. Any doubt that they had about our shopping for personal food purchases was quickly dispelled as we bought 24 bags of dates, 16 bars of dark chocolate, 2 kg of almonds and 12 jars of tahini. Shopping finished, we went to meet a woman in Nea Kavala camp who had a small baby and a large family. We are not registered with the camp and are therefore not allowed in for any reason. Nea Kavala camp now has containers which are basically just empty boxes, with no amenities but air conditioning. We ended up sitting in our parked car outside the camp gates and chatting, awkwardly, especially for Kimberly, who was stuck on the passenger’s seat facing backwards. The woman amazed us with her strength and fortitude. She seemed calm and pleasant, taking what life had dealt her in stride. 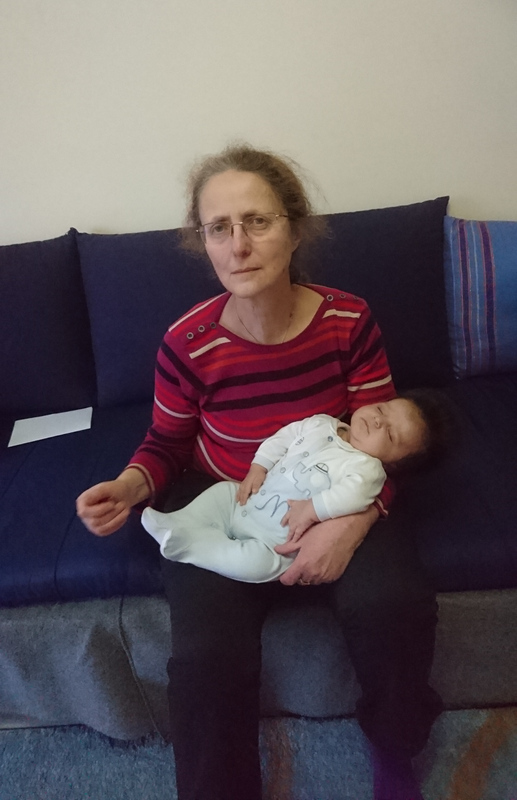 As with almost 70% percent of deliveries in Greece, she had had a caesarian, her first after 5 natural deliveries. We finished our day in Polykastro at the same apartment where we began. This time we visited Maryam with the baby girl who we had previously seen with blanket over head . The flat was damp with aspergillus mould on the walls. The floor is covered with the ubiquitous UNHCR blankets and mats. Why does the UNHCR deem it necessary to stamp its name all over its donations? The family is lovely. Maryam is super competent and wraps the baby like a burrito. Once settled, we heard the story of her birth. It was the 31st of December and Maryam had been in light labour for several hours. She was taken by a volunteer in their car 25 minutes to Kilkis hospital. There, the lone doctor on duty said that Maryam must have a caesarian section. Her husband and she were both adamant there is no need. Both her other two had been natural deliveries so there was no need for a caesarian section. The doctor refused to deliver the baby. How can you refuse to deliver a baby? Fortunately this is a close couple and they were of a single mind that a caesarian was unnecessary. They made the competent decision to go to Thessaloniki and have a natural delivery there. 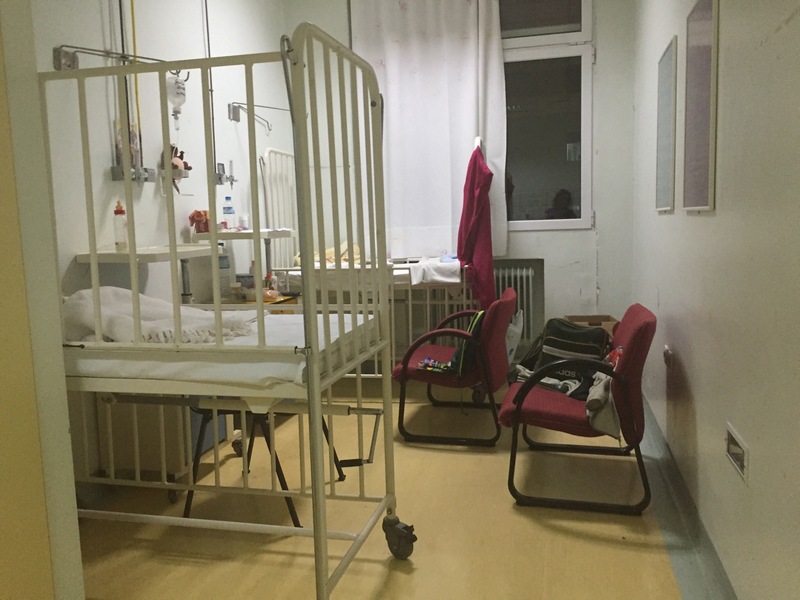 If you read other baby related blogs, you may have heard of Kilkis Hospital. To meet one of its “patients” who was victorious is quite a thing. However, not all people that we met were lucky enough to have a volunteer willing to drive them all over the country. Any one who had come to the hospital in the usual way- by taxi or by bus – would have been left to their fate. Then it was home to supper, ouzo and more work before hitting the sack at half past one. 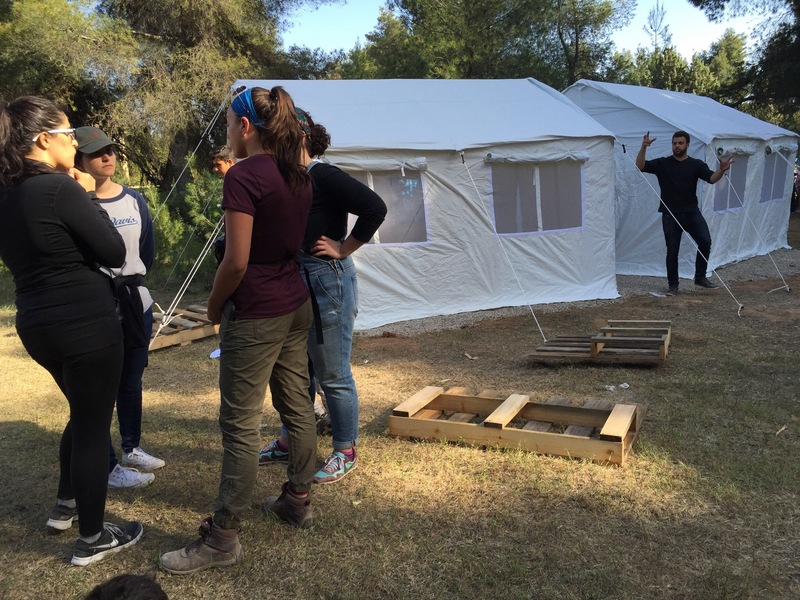 Highlights: Visiting two hotels in the industrial area surrounding the Thessaloniki airport which are housing vulnerable people formerly in Nea Kavala camp. Hotel 1: The “Four Seasons”. Grubby, small rooms, sticky floors and kids playing in the car park. Far from all amenities, children who formerly went to school in town now have only English lessons and outings. 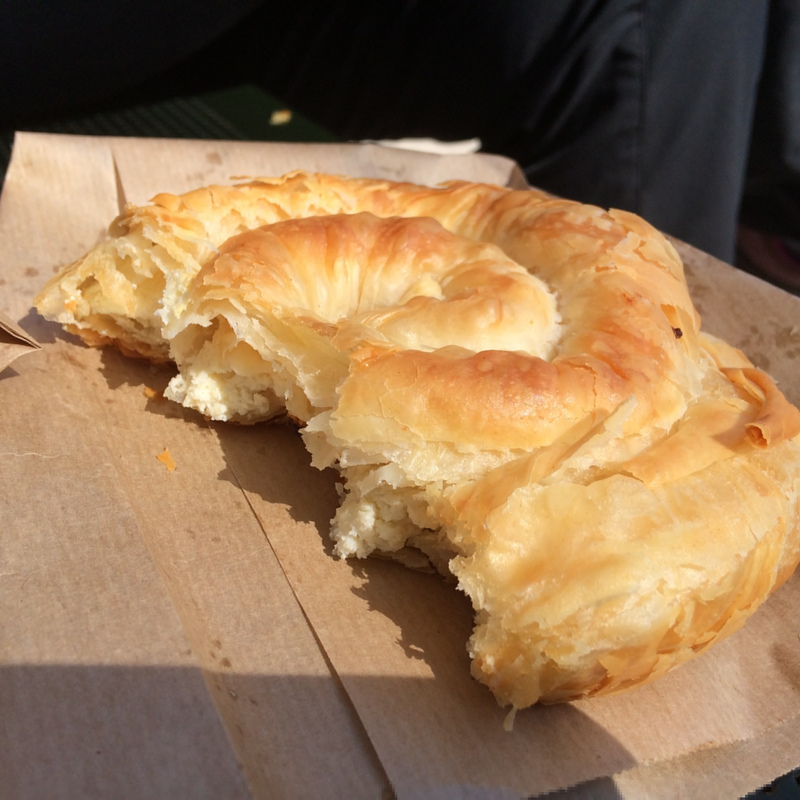 Food is OK, provided by the hotel but over salted and greasy. Rooms are cramped, the kind of place that you would be happy to stay in for one night and then leave. Hotel 2: The “Athena Palace” Hotel. Isolated, the shop on the outskirts of town is a ten minute bus ride. Cleaner, more spacious and more modern. The atmosphere in the dining room was one of dejection, of fulfilling an obligation. This is in stark contrast to meals that we have been invited to in refugees homes, which are meals of beauty and grace. 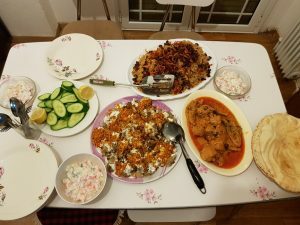 While the circumstances out side of the meal are not much different, refugees in their own apartments are able to feel much more “at home” simply by being able to cook. Obviously we weren’t there to just sit and chat, many moms and babies were seen. We will be returning in the coming days and promise more on them later. From the hotels, Sally came to the Thessaloniki airport to pick up Kimberly, just off of a long plane ride from Canada, and then back to our apartment in Nea Kavala for some much needed rest. A blog post from Kimberly Reine at the Kindness of Strangers. Reposted with permission. See the original post here. The “women’s tent”. The concept seems to be one from a historical novel set in biblical times. Who could honestly ever think that such a thing could exist in our day and age? A space for women? Of course. A women’s tent? No way. Too romanticized, too cliché, too 100 AD. And yet, it did exist, and eventually it flourished. For those people who want to know what I actually did in a refugee camp, working at the women’s tent pretty much sums it up. The first few hours of my first day at Ritsona I felt a bit lost and was starting to worry that I was on a fool’s errand. I met many people who were there for the long haul, specializing in practical things like humanitarian aid and translation and making a real difference. With my completely impractical “artistic” background (music and graphic design) and the fact that I had two small children (ages 2 and 4) at home who prevented me from staying for very long, I was starting to feel a bit useless. In the end, it turned out to be my two children who had given me the best possible training and a skill set that was not often found in the average volunteer. Most of the volunteers were “footloose and fancy free” with no kids, or “empty nesters” with grown children of their own. I, on the other hand, had been pregnant twice in the past 5 years, breastfeeding in the past year, had transitioned to solid foods, sleep-trained, toilet-trained, etc. I was all “up to date” on what the current guidelines were for anything pregnancy, baby and toddler related (you would not think there would be a need to be “up to date” since babies have been around since the dawn of time, but they do keep changing all the rules). In short, a perfect fit for the women’s tent. When I began working at the women’s tent, it was a tent like all the others in the camp, the one at the very end of the row that was left over when the others were distributed. It held the sanitary napkins, the diapers, the underwear, the sunscreen and ‘night’ cream (more on those later) and any supplies that women were mildly embarrased to order from the distribution container because they were too private, frivolous or what have you. Perhaps the most important aspect at this time was that of the supplemental food for the pregnant and breast feeding women. Shortly before my arrival, other independent volunteers had taken a horrified look at what was passing for a balanced meal at camp (balanced? the only thing balanced was the caterer’s bank account) and immediately realized that it was grossly inadequate for the nutritional needs of pregnant and breastfeeding women. Actually, it was inadequate for everyone, but you have to start somewhere. They compiled lists of who was pregnant, how far along they were, who was breastfeeding and how old the baby was, etc. 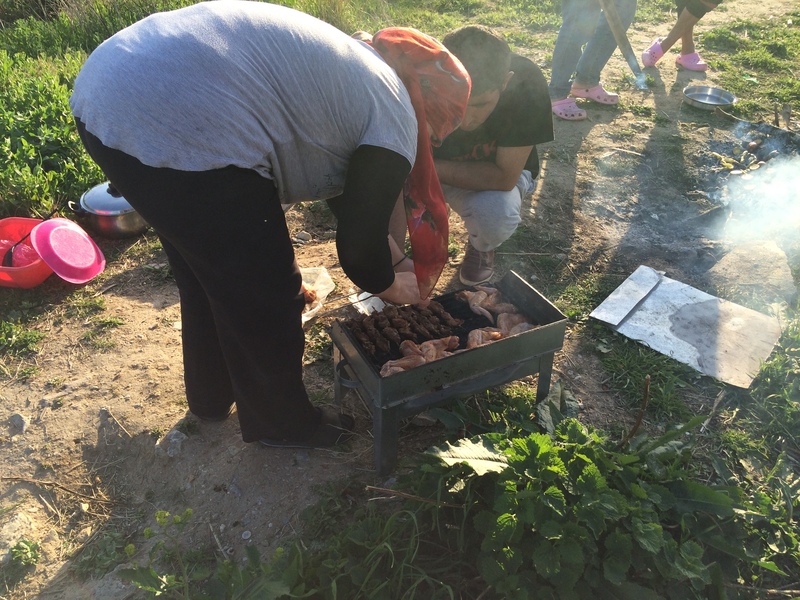 Around 10% of the women in camp were pregnant, another 10% breastfeeding, which gave us 40-50 women to feed. With this information we would go out to the supermarket in the morning and choose one vegetable, one fruit and one protein. Tuna, eggs, yoghurt, cucumbers, tomatoes, apples, bananas and more were on the revolving selection. Protein proved the hardest as pregnant women are not supposed to be eating canned fish more than a few times a week, no one liked beans (“because of the gas” one woman confided), the tinned meat was non halal and eggs had to be pre-cooked the night before, when we were too exhausted to do anything. Yoghurt was by far the most popular choice. We then would go tent to tent, seeing how the women were doing and handing out the food. Normally we would have to do several trips to and from the women’s tent, where the food was being held, since there was only so many kilograms of produce one could drag around in the blazing sun. The men would see us coming on the rounds and would pat their tummies and say “me too, I am pregnant too!” Fortunately, one of the most useful terms I happened to know in Arabic was “pot belly”, and when I would smack the proffered tummy and say “Not pregnant, just a pot belly!” there were always roars of laughter. Less funny was seeing a pregnant woman with two or three other small children and telling her that this was food just for her and the baby inside her, not for her other children, who by that point would all be clamouring for a taste of the cucumber or tomato, having not eaten any vegetables in days. 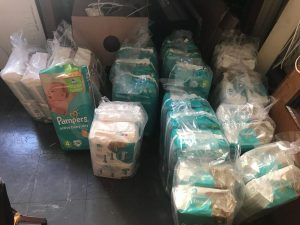 As a mother myself, I knew it would only be a matter of minutes before these would be scarfed down by her kids, and I know I would do exactly the same in this situation, at whatever cost to my own health. What made me really sad was that, while we could always hand out an extra fruit or yoghurt to the moms for their kids, there were so many other children at camp whose mothers weren’t pregnant and who would not be benefitting from this extra treat. 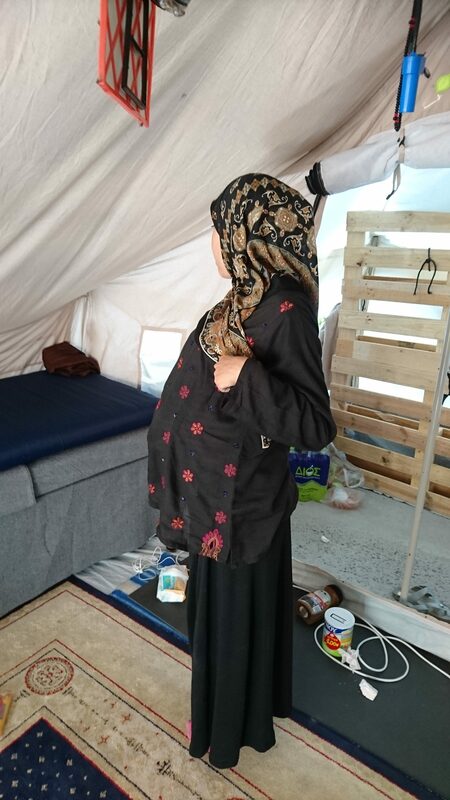 A pregnant woman in her tent. I can’t stand to look at stock photos of smiling healthy pregnant women surrounded by brightly coloured fruit and vegetable doodles saying “fresh fruits and veggies are key to your baby’s health”. I don’t think that anyone doubts this, most pregnant women, myself included, even crave them. The fact that women in camp live in a fertile mediterranean country and can only be rationed one cucumber and one banana per day breaks my heart. I was sick the other weekend, a bit of mild tummy upset that had me feeling all miserable and needy. I mostly sat on the sofa and ordered my beloved to bring me herbal teas and bubbly water with lemon, but part of my misery was the thought that while I was unlucky enough to be sick, I was lucky enough that whatever little finicky thing I thought might alleviate my nausea would be intantly brought to me. I know many of the women suffering from morning sickness would ask for lemons and mint, and would have to wait at least until the next day until it appeared. 24 hours is a long time when you are nauseous and all you have to drink is lukewarm water. After several of the women in their early stages of pregnancy asked us for lemons, we ransacked the tree in the backyard of our air bnb and brought a whole sack of them to camp. Mass chaos promptly ensued since everyone, pregnant or not, wanted some. Kids were walking around sucking on wedges of lemon and everyone was happily squeezing them on their dinners that night. Women would also come to the tent to discuss their concerns about their own health and that of their babies that they did not deem serious enough to warrant an actual visit to the Red Cross. Or perhaps because we offered a shady spot (unlike the Red Cross waiting “room” which was in the blazing sun) and a sypathetic ear (again, often in short supply at the Red Cross tent). Often, women would come for breast feeding advice as they were worried about the lack of proper nutrients or substance in the food and did not feel that they were producing enough milk. Normally, what they needed above all was a bit of reassurance that all was still well, that the food may well be terrible, but that they were indeed still producing milk. One of my fellow volunteers taught me a wonderful way to help women regain confidence. You ask if you can see how the baby feeds, wait until it has likely had its fill and then ask the mother to detach it. Most of the time, a stream of milk will appear around the baby’s mouth and you can say, “Look! You have so much milk! And your baby looks so healthy, too.” Not the most scientific, but when you don’t share any common language, it was quite effective. It was at one of these sort of visits that we met Gulawi and Şana. Two women came in with their babies, one of them because she was concerned that she had stopped producing enough milk for her 6 month old, and they other one to offer the first some moral support. They both sat down and started breastfeeding without any apparent problems. We chatted and got to know each other, and I asked the second woman, who had a much smaller baby, how old her baby was. I was expecting her to say 3 or 4 months, based on the baby’s size and the fact that the baby did not seem able to hold up her head. When she said 10 months, I nearly fell over in surprise, and after having two preemies of my own, I am certainly no stranger to smaller than average babies. I asked her if the baby was eating well – mostly to keep the conversation going since most people don’t take kindly to random strangers telling them that their baby doesn’t really look so healthy- and she said that the baby only drank breast milk, that she refused any water, baby cereal or solid food, and had her entire life. Starting to get increasingly alarmed, I asked if she had other children and she replied that she had four other children, and that they had all started eating solid food at the age of around 6 months. I asked if she had any idea why this one was so reluctant to start and she said that when she was 4 months old she had a bad throat infection and it seemed to hurt her to swallow. After ascertaining that we were all indeed worried about her, we added both mothers on to our list of people requiring supplementary food and got their names and tent numbers. The next time we saw Gulawi she told us that they had been to the hospital in the closest town when they had first arrived, because they had been in the hospital on the Island where they first arrived in Greece and the doctors there had told them that when they came to the mainland that they should immediately take the baby back to the hospital. 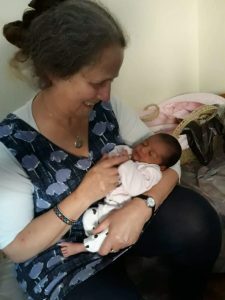 Unfortunately, when the local hospital told her that she needed to go with the baby to Athens, an hour away, for an indefinite stay, she would not go. She told me that she had had no way to even tell her husband and other children where she had gone (neither of them had any mobile phone), no money whatsoever, no clear idea of where Ritsona camp was even located and certainly no way to return! Most likely she had initially thought that it would be a short hospital visit or that she would be leaving the baby at the local hospital and when she was forced into making a quick choice, she opted to keep the family together rather than risking separation. She told me that the doctors had been very angry at her, and she made a dusting her hands together motion and said that the doctor implied that she had lost her chance. She asked if there was any way I could help her. I looked at Şana lying listlessly on the floor, playing with a piece of plastic wrapper, her complexion looking ever more sallow than it had a few days ago. I said I would see what I could do. While the decision to take a sick baby to the hospital may seem like a bit of a no-brainer, it is in fact not really “protocol” that an independent volunteer should be taking health care decisions into their own hands. The Red Cross is at camp in order to take care of the residents’ health care, and if every time some one got sick some well meaning soul drove them to the hospital, both the hospital costs (which fall on the Greek government) and the the amount of paperwork required for follow-up would be extortionate. We discussed it thoroughly, and it was pretty much unanimously agreed that if the baby needed to go to the hospital and the parents wanted us to help them take it, then we would. Forewarned is forearmed, and this time we communicated as much as possible with Gulawi about what to expect, and how to best plan for it. 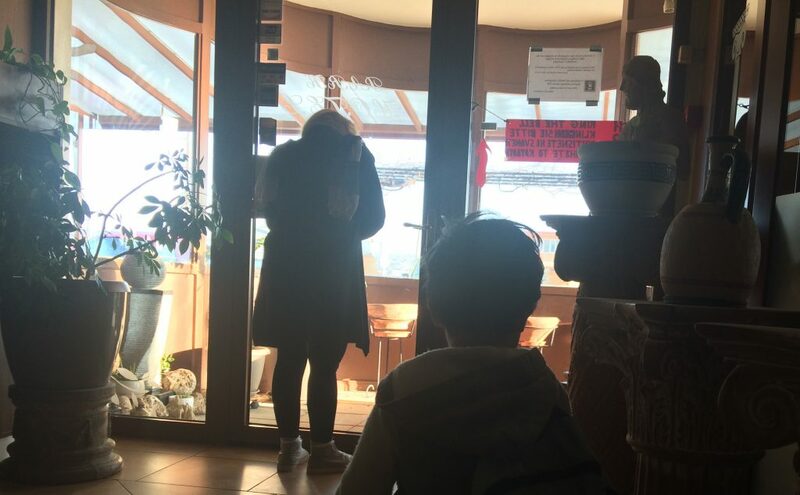 We told her that she should plan for a lengthy stay and she decided that the baby’s father would be the one to go because she needed to stay at camp and take care of her other four children, two of whom were under the age of 5. She said that in a few days they would change places, and that every time a volunteer was going to Athens and could give them a lift, they would change places. We formed a fairly sombre parade on the way to the hospital. There were 5 of us; Şana, her father, the translator, another volunteer who drove us in her car and myself. We had quite a long wait at the hospital and we passed time playing cards and eating ice cream. Şana’s father, though very pleasant, had clearly never taken care of her before, and at one point she dirtied her diaper and stricken looks were exchanged as it became clear that he had no idea how to change it. I volunteered for the task and when I went to the bathroom and removed her diaper, I saw how the bones in her bum stuck out with not an ounce of padding to be seen I broke down and cried at the hopelessness of the whole situation. When we were finally seen there was quite a lot of action. It turns out that with the many tumultuous events in their lives recently, her parents had forgotten that she was not 10 months old, but rather turning one the next week. What most shocked the medical staff was that she was born at a healthy 4.5 kg, and at one year old, she had fallen to only 4 kg. Once she was installed in her room I took her father and the translator to eat something, as it was close to 10:30 p.m.. The other volunteer stayed with Şana and chatted with the mother of the other baby in the room. She was a single refugee mother from Pakistan with 3 children. 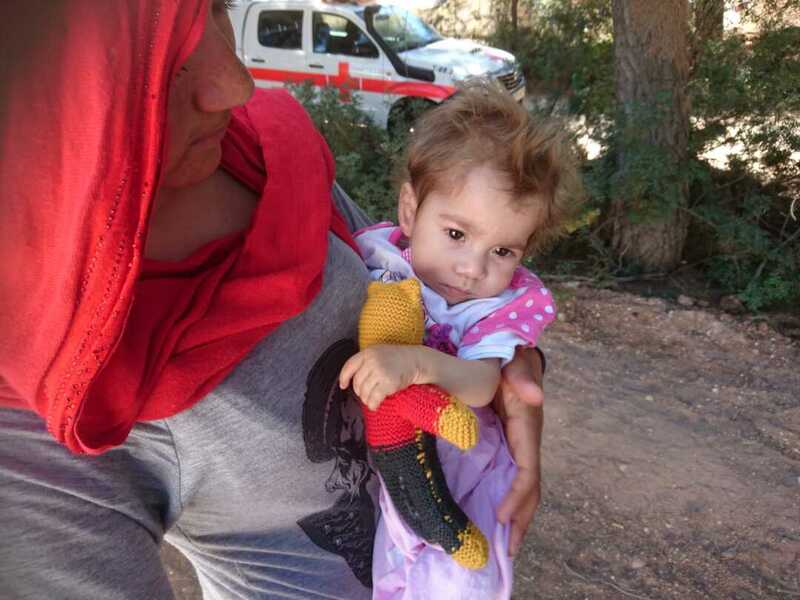 Her youngest, only a few months old, had been born in Greece and was having health problems. Parents have to stay with their children at the hospital, which meant that her other two children, both under 4, were back in the camp. When asked who was looking after them, she said she didn’t really know, but that she hoped one of the neighbours was. 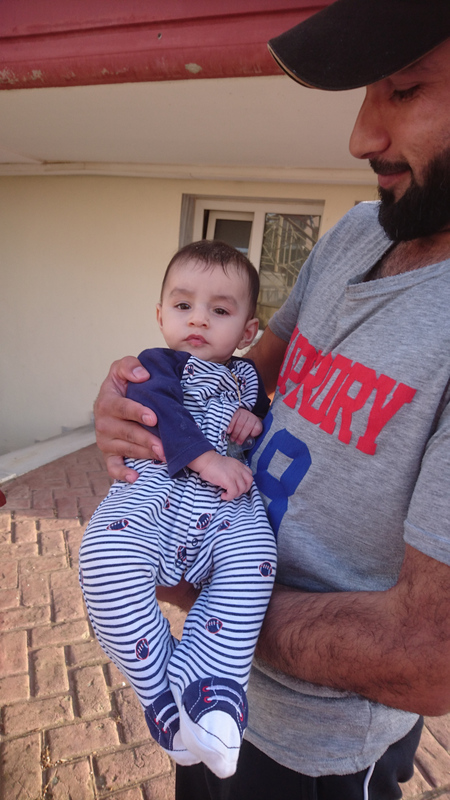 Şana’s father stayed with her when we left the hospital that night, looking small and frightened as he faced an uncertain future. With only a package of cigarettes, some worry beads and 20 euros that we had left him for food, we promised to return in two days. When I returned it was on my way to the airport. For two days he had been sleeping in an armchair, unable to communicate with anyone, which meant that he had no idea what that state of his daughter’s health was. He was happy to see a familiar face, and very happy with the mobile phone that we had brought him so that he could talk to his wife and family (even if it meant calling someone in camp and asking them to take their phone to his tent and let his wife use it). Needless to say, the Red Cross was not so happy that we had intervened. Dr. Condescension told me “this is really too bad, if you had waited another day or two instead of playing the hero, we were just on the verge of arranging an apartment for the whole family”. I told him that they would certainly welcome that and that he should go ahead with it by all means. Somehow, though, it never materialized. With all of the stress involved with having the family split up, it was no great surprise that Şana’s time in the hospital was shorter than desired. 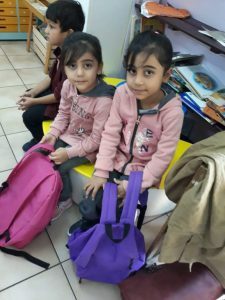 After 10 days, when her condition started to improve, her mother packed her up and got a ride back with the inexperienced young volunteer who had been sent with supplies. There was still no clear idea with what was wrong with her, but at least the warning bells had been sounded. Back at camp extra effort was made to get her started on solid foods, with Gulawi bringing her into the women’s tent several times a day to have her fed by one particular volunteer that she said “had a special touch”. In the end, I realized that Sana was considered as “collateral damage”, that if push came to shove, this family of 7 would choose to stay together and possibly lose its smallest member rather than face the risk of being split in half and spending the next few years searching for each other in vain, as has happened to other families. In Europe. In 2016. EPILOGUE: A few months later a fellow volunteer tagged me in a video. 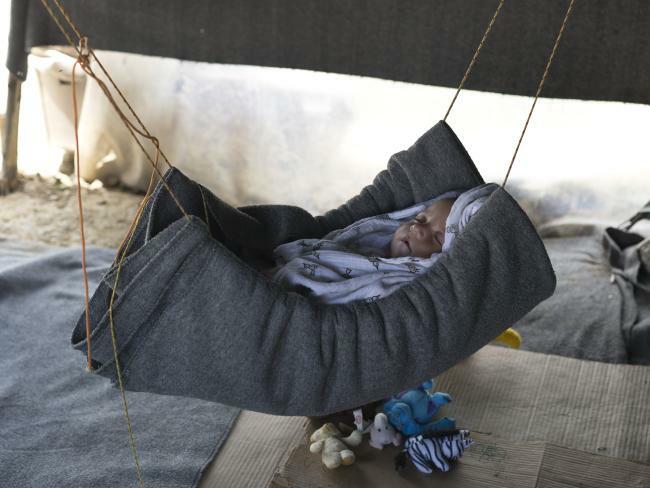 It showed a plump baby toddling around the woman’s tent. I absentmindedly looked at it and then went back to work. Seconds later she messaged me “Do you recognize her?! It’s baby Şana!” I had to look at the video another few times to believe it was the same baby. There was no similarly to the sickly, starved looking baby that I knew and this rosy cheeked, glossy haired toddler smiling back from the screen. This video made me more sentimental than any video of my own children ever has and I often watch it and think of her and her family. Perhaps they have moved on, perhaps I will see them next time I volunteer, still in the same tent one year later and no closer to any semblance of normal life. Afterword: As you can probably imagine, nobody is really called by the names I used here. Friends and neighbours may have swapped names, I may have been inspired by literature, other names I found beautiful were used to describe people I liked, my only goal was not to have pseudonyms that were blatantly un-realistic…. 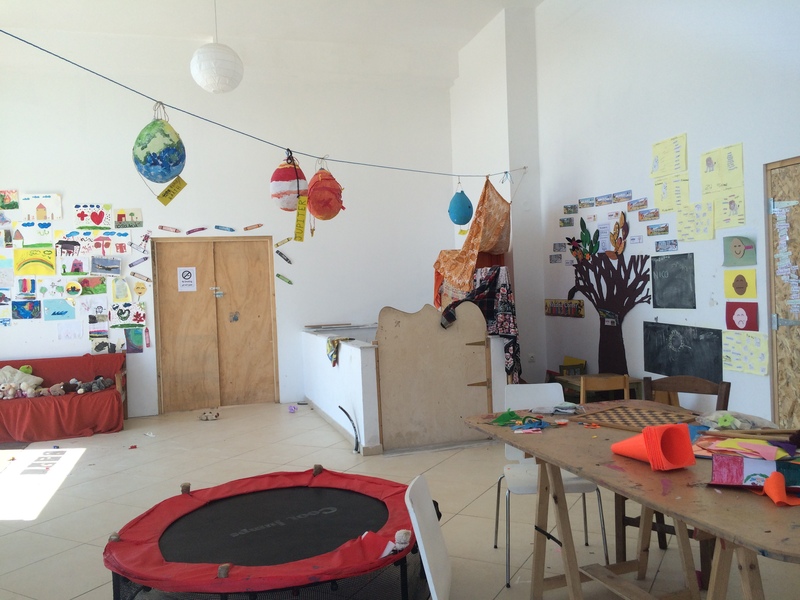 This is a place where CRIBS International staff and other colleagues involved in the refugee crisis can post their thoughts and musings. We hope that you enjoy them!